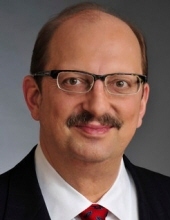 Joseph G. Kurzydym, 61, of Naperville, IL, passed away suddenly October 14, 2018 at Edward Hospital. He is survived by his loving wife and best friend of 27 years, Nanette (Kravchuk) and four sons: Michael Joseph of Fort Lauderdale, FL, Steven Joseph of Naperville IL, John Joseph and Thomas Joseph of Naperville, IL; beloved son to Joan (late Eugene) Kurzydym; dearest brother to four siblings, Kathleen (Joseph) Joyce, Barbara (late George) Gonzales, Patricia (James) Martinez and Cynthia (Richard) Stahura; remembered by mother-in-law, Helen (late Richard) Kravchuk, sister-in-law, Carrie Kane, brothers-in-laws Richard (Susie) Kravchuk Jr. and Mark (Mary) Kravchuk; loving Uncle to Adam, Rachel, Elizabeth, Cordero, Megan, Alex, Maddie, Taylor, Natalie, Rose, Nate and Maggie and Great Uncle to Lucy, Addison and George. Joe was born in Hammond, IN, February 1957. He was a 1975 graduate of Hammond High School and received his degree in Accounting, Finance and Management at Indiana University, Bloomington Campus, in 1980. He held a variety of positions including Senior Manager at KPMG Peat Marwick, Vice President of Finance/Reporting at JMB Realty Corp. and most recently, until his retirement in March of 2014, Chief Finance Officer, Treasurer, Secretary and Executive Vice President at Lillibridge Healthcare Real Estate, a Ventas Company. Joe and Nanette met on a blind date in 1989 at The Como Inn in Chicago. It was love at first sight. They married in 1991 and went on to raise their four sons in Naperville. Joe was an Eagle Scout and volunteered as a troop committee member, leading all of his sons to achieve the rank of Eagle Scout. Throughout his life, Joe loved Pokagon State Park, and cherished his visits there from when he was a young boy into adulthood. Those who knew Joe well, were aware of his love for Indiana University, the Cubs, McDonalds, tamales and tacos from Taco Real. A visitation will be held on Friday, October 19, 2018 at Friedrich-Jones Funeral Home & Cremation Services, 44 S Mill Street, Naperville, IL 60540 from 3:00 PM until 8:00 PM. Additional visitation will take place on Saturday, October 19 from 9:30 AM until the Mass of Christian Burial 10:00 AM at Holy Spirit Catholic Community, 2003 Hassert Blvd, Naperville, IL 60564 with the Rev. Dennis Lewandowski officiating. Joe will be laid to rest at St. Peter and Paul Cemetery in Naperville, IL. In lieu of flowers, the family asks that donations be made to Autism Speaks or The Alzheimer’s Foundation. To send flowers or a remembrance gift to the family of Joseph G. Kurzydym, please visit our Tribute Store. "Email Address" would like to share the life celebration of Joseph G. Kurzydym. Click on the "link" to go to share a favorite memory or leave a condolence message for the family.